Over Thanksgiving weekend of 2016, three-year-old Ireland started to complain of a headache. It got worse and worse until she vomited, and then she felt better. It worried Tori and Robert, her parents, but they decided to just keep an eye on it. But then, in mid-December, the same symptoms: headache, vomit, relief. When it happened yet again a few days before Christmas, they’d had enough: they took Ireland to the emergency room in Yakima. The pediatrician ran through some tests with Ireland, including one where the doctor asked her to close each eye and touch first her nose, and then the doctor’s finger. With her right eye closed, Ireland was perfect. But with her left eye closed, her finger wavered in the air; she couldn’t hit the pediatrician’s finger. The pediatrician referred the family to a neurologist at Seattle Children’s Hospital, and they scheduled an appointment during the first week of 2017. Over the New Year’s weekend, Ireland’s symptoms worsened rapidly: her left leg started to drag, one side of her face began to droop, and she suffered a seizure on New Year’s Eve. So Robert and Tori decided not to wait for their appointment. Early in the morning on the first day of the year, they put Ireland in the car and drove, through a snowstorm, over the Snoqualmie Pass to Seattle. “We were just praying that they wouldn’t blow us off or send us home,” says Tori. “Little did we know that an hour after we got there, they would tell us that she had a brain tumor.” At that time, the tumor was about the size of an orange — so large that the doctors were astonished that she was even awake. Ireland had surgery to remove the tumor three days later. 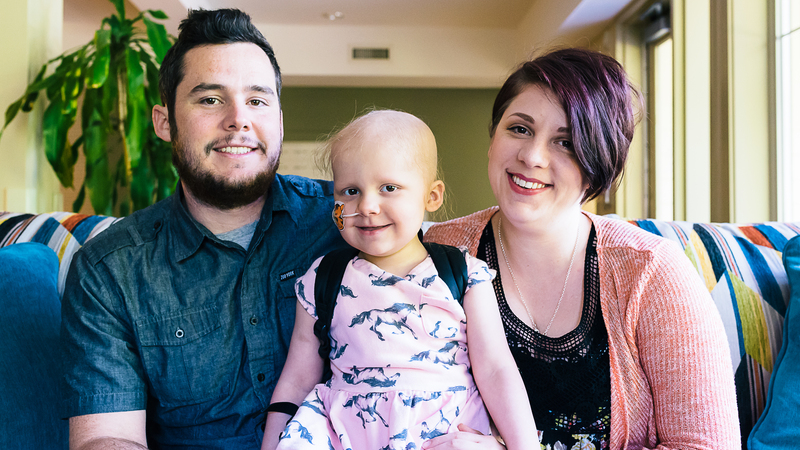 After the surgery, Ireland was still facing a long course of treatment, but there were no rooms available at the Ronald McDonald House. So the family moved from one place to another: first to the Silver Cloud Inn, then the Camlin Hotel, and then finally to the nonprofit Seattle Cancer Care Alliance House. They lived at the SCCA House for three weeks. Finally, a room opened up at the Ronald McDonald House in Seattle. Robert and Tori were relieved — though they were a little unsure at first of what they would find. At the House, Ireland has become fast friends with several other young girls undergoing treatment for cancer. She’s gone to craft nights and dinners, movie nights and therapy dog visits. She loves baking cookies in the communal kitchen, especially with a staff member that Ireland has nicknamed “Teacher Sarah”. Tori and Robert will be happy to take Ireland back to Yakima, but they’ll be leaving behind a community they never expected to join: volunteers that help them get through the day; kids undergoing the same treatment as Ireland; other parents under the same stresses that they are. The Ronald McDonald House, they say, has become a place where they feel at peace. Our donors and volunteers help us support Ireland and families like hers. To find out more about how to get involved, please visit our Donate and Volunteer pages.